Here's a look at Indonesia's volcanic hot spots. Why is Indonesia prone to quakes and eruptions? Indonesia is a vast archipelago that sits on the Pacific "Ring of Fire". The Ring is a 40,000km arc that stretches from New Zealand, to Papua New Guinea, Indonesia, the Philippines and Japan, across to Alaska, the United States, Mexico to the southern tip of South America. It is where tectonic plates collide and a large portion of the world's volcanic eruptions and earthquakes occur. The United States Geological Survey says more than half of the world's active volcanoes above sea level encircle the Pacific Ocean to form the Ring of Fire, while about 90 per cent of the world's earthquakes occur along the ring. How many volcanoes does Indonesia have, and how many of them are active? Indonesia has 127 active volcanoes, with seven of them currently in the 'eruption phase', the Sydney Morning Herald reported, citing volcanologist Janine Krippner at West Virginia's Concord University. A volcano is deemed as no longer in the eruption phase when it remains inactive for a period of three months. Anak Krakatau is among the volcanoes currently in the "eruption phase" and has been rumbling on and off since July. Dr Krippner says it is one of the world's most active volcanoes. Formed from the eruptions of the legendary Krakatau volcano, it was among 20 volcanoes in Indonesia listed by the government as alert zones for travellers last Wednesday, the Jakarta Post reported. It is currently at the second highest level in the four-level scale, which goes from normal (level 1) to caution (level 2), alert (level 3) and danger (level 4). 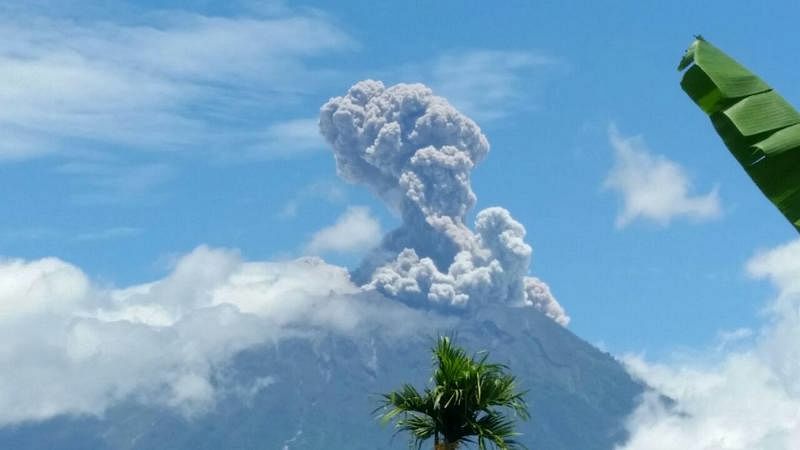 Other volcanoes on the list included Mount Soputan in North Sulawesi, also at level 3, and Mount Sinabung in North Sumatra which is currently at the highest level. Mount Sinabung, which has been rumbling since 2010, saw deadly eruptions in 2014 and 2016. An eruption in February this year saw it spewing massive clouds of smoke and ash, leaving local villages coated in debris and officials scrambling to hand out face masks to residents. Another recently active volcano is Mount Merapi, which is currently at alert level 2. 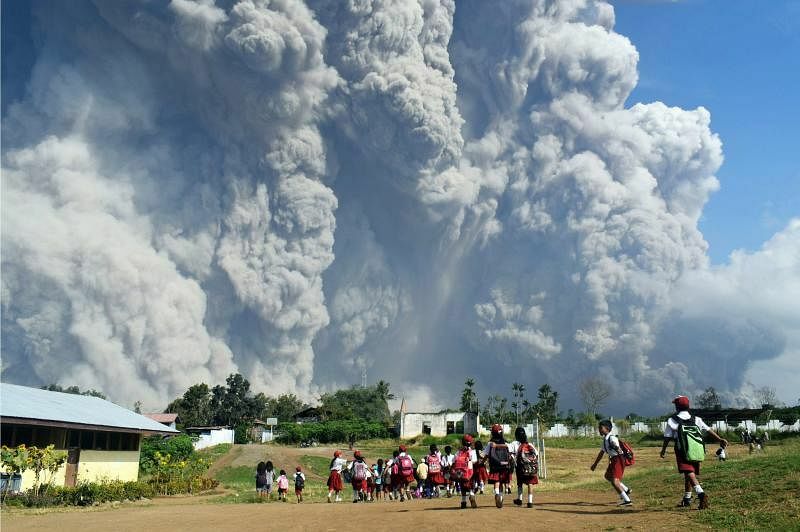 Located north of the city of Yogyakarta, its series of small eruptions in May prompted the evacuation of residents living around the volcano and the closure of the city's airport. Meanwhile, Mount Agung, a volcano on the island of Bali, has been erupting periodically since it rumbled back to life last November. It is currently at alert three. An eruption in June temporarily shuttered the holiday island's popular airport and grounded hundreds of flights. The last major eruption of Mount Agung in 1963 killed around 1,600 people. Along the Ring of Fire, a number of major tectonic plate boundaries collide. The interconnected series of fault lines are constantly under pressure from super-hot molten rock beneath. How can a volcanic eruption trigger a tsunami? Tsunamis are often triggered when large amounts of water are quickly displaced by earthquakes. But Indonesian geologists say last Saturday's tsunami was likely caused by volcanic activity when an eruption caused a section of the volcano - in the south and southwest sides - to collapse and slide into the ocean, triggering the tsunami.